WHAT IS THE MINIMUM WEIGHT A LOAD CAN SENSE? A load cell is a device that can be used to measure the weight placed on it. In other words, it senses the weight of the object or the size of the force applied to be measured and then creates an output that is proportional to the weight or force. It is, therefore, possible to measure any weight size or force of any magnitude depending on the material of construction of the load cell and its design. As a matter of fact, the minimum weight a load cell can sense depends entirely on the specifications of that particular load cell. A load cell is of different types and will be seen in the next section of this article. There exist various commercially available load cell types that are legal for trade and can easily be purchased through the website of any reliable original equipment manufacturer like Tacuna systems, VPG transducers, AMCELLS etc. Pneumatic load cells, hydraulic load cells, strain gauge load cells, vibrating wire load cells and capacitive load cells are just a few out of the numerous types. Each load cell type has its various filed of applications, designs, loading capacity and mode of operation. The way Pneumatic and hydraulic load cells work makes them to be referred to as force-balance sensor devices. Their working mechanism depends on a medium in a confined space operated under the pressure exerted by the weight to be measured. The output of this devices is seen on an analog pressure gauge. The pressure gauge might be rated in Newton, therefore weight conversion calculation will have to be performed on the reading to obtain the weight equivalent value. Strain gauge and capacitive load cells work as electrical transducers because their output is an electrical signal this signal has to be conditioned and processed to give its equivalent value or for process control. The strain gauge load cell is the most used across several industries amongst all the load cell types due to a lot of its advantages. The rest of this article will, therefore, discuss how to determine the minimum weight a strain gauge load cell can detect. The design of the load cell determines its weight capacity. Generally, it is made up of strain gauges that are fixed/bonded to parts of the device’s structural members and are electrically connected to form a Wheatstone bridge. The strain gauge itself is a resistive foil material and it is the underlying mechanism for the operation of this load cell. This piece of material is always micromachined and its attachment to a structural member of the load cell makes it undergo deformation in dimensions. It converts the weight or force applied into an electrical output of the load cell. Where, R is the electrical resistance of the gauge, ? is the resistivity of the gauge material, L is the length of the foil, and A is the area of the material. Therefore, from equation 1 above, it can be seen that a change in the length of the material causes a change in the cross-sectional area of the strain gauge, thereby resulting in a change in resistance. A strain gauge load cell being an active transducer will, therefore, produce an electrical output voltage when electrical energy is supplied to its terminals from an external source (mains or battery) due to the change in the resistance of the strain gauge as the applied weight deforms its dimensions. Therefore, the sensitivity of this material is of high importance and it goes a long way in determining the minimum detectable signal (MDS) and as such, the minimum weight the load cell can sense. Furthermore, the noise around the conductors, the conditioning circuit, and the output interfaces can also affect the sensitivity of the device. The strain gauges of the load cell can be electrically connected in a ben bridge circuit to be of different configurations. They are the quarter-bridge, half-bridge, and full-bridge configurations. For each configuration, the presence or absence of an active strain gauge element in the four arms of the Wheatstone bridge determines its name. Therefore, a full-bridge configuration has four active elements, one in each of its four legs. A half-bridge configuration has two active elements arranged in two alternating arms of the Wheatstone bridge, while the remaining two arms are fixed up with resistors. A quarter-bridge has a single strain gauge on a single arm of the Wheatstone bridge and a temperature compensating dummy gauge fixed to the alternating arm. Obtaining accurate measurements of even the smallest weight sizes requires a proper selection of the load cell to use for its measurement. The following should be considered when making the choice. Understand The Application And Specify The System Requirements: Specify if the weight to be measured is going to be a static load or a dynamic load. Consider the sensitivity of the load cell to very small parameter changes since we will be dealing with a small minimal weight measurement. The Load Cell Capacity: Each load cell device comes with a datasheet that shows its specifications. The next section of this article discusses the basic specifications to focus on in determining the minimum detectable signal your load cell can sense. The Environmental Conditions: The ambient conditions under which the measurement will be or is being carried out should also be factored in, as it affects the results. These environmental conditions include temperature changes, wind and shock loading, mechanical vibrations, electromagnetic interference, radio frequency emissions, atmospheric pressure, and moisture. All these factors can generate noise that will affect the output of the load cell for that particular small weight ring measured and even all other weight ranges. 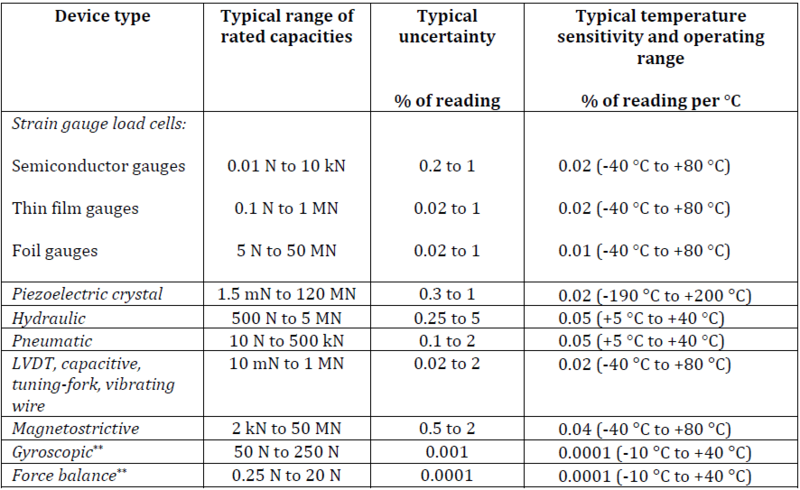 The figure below shows a sample datasheet specification. Zero Balance: This is the electrical output signal of the load cell when no weight or load is placed on it. Non-Linearity: This expresses the maximum deviation of the calibration curve that is obtained by gradually increasing the applied weight from the zero balance level to the rated output of the load cell. The smaller the non-linearity, the more accurate measurement we obtain. Hysteresis: This is the numerical differences between two electrical output signal values of a load cell for the same load range. The first value is obtained by increasing the applied weight from zero balance to the rated output, while the second reading is obtained by decreasing the rated output to the zero balance level. The smaller this numerical difference is, the more accurate measurement we obtain. Non-Repeatability: This is the maximum difference between the electrical output signal of the load cell for repeated loadings under identical environmental and loading conditions. A small value depicts a high system accuracy and reliability. Creep: This specification becomes very important when the weight is a constant load to be placed on the load cell for a long time, maybe for monitoring purposes. Creep is the change in the load cell output signal level with respect to time under a constant load, with all environmental conditions being constant. Temperature Effect on Output: This is the effect of temperature shifts on the output of the load cell as it tends to introduce errors that affect system accuracy. Temperature Effects on Zero Balance: Temperature shifts also affect the output signal of the load cell under no-load. To cater for both types of temperature shifts, ensure the load cell design you are using incorporates a temperature compensation technique. The minimum weight a load cell can sense depends on a lot of factors as discussed in the main body of this article. The choice is therefore left for you to prioritize the degree of importance of these factors according to your specified requirements.